Are you looking for attic efficiency services in The Woodlands area? Call 281-704-3696 today for expert whole-house comfort solutions at affordable prices. You are losing energy from your attic as you read this. Call today to keep more money in your pocket. Access our online coupons and specials here. Many homeowners don’t realize the importance the attic has when it comes to keeping their home comfortable and their energy costs down. Attic efficiency is an important topic that rarely gets talked about, but it's one that can save you money every month. Once you find a reputable provider of high quality attic services, you can learn about this critical part of your home maintenance and make the necessary adjustments. Want to know what your neighbors throughout The Woodlands, TX have been saying about our range of attic efficiency services? Click here to read our latest customer reviews. A leaky attic is a sure way to throw money away, because your heating and cooling system has to work harder to maintain the ideal temperature inside the house. You end up losing valuable warm air in the cooler months while losing cooling efficiency during the summer. Having all attic leaks addressed will increase your home's energy efficiency, reduce the frequency of HVAC repairs, and keep more money in your pocket. Attic efficiency also requires adequate ventilation. When there isn’t enough air movement in your attic, it can become stagnant and moisture ends up being absorbed. As most homeowners know, excess moisture equals mold and rotting wood, which are health hazards for your family. When your attic is vented correctly, the air is circulated and never has a chance to take on moisture. Proper attic ventilation also helps your roof tiles last longer, saving you even more money. 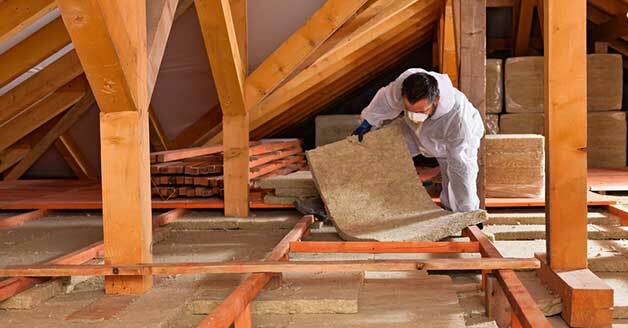 Some homeowners and builders don’t think to insulate the attic, and if they do it isn’t to a sufficient level. Having the ideal levels of insulation in your attic is another important factor in ultimate attic efficiency. If you are unsure if your attic insulation is where it needs to be, or if it’s been several years since you’ve had it checked, now is a good time to have it inspected. When you call Affordable American Air Conditioning & Heating at 281-704-3696 in The Woodlands, TX, we will provide you with a comprehensive solution. Just schedule an appointment and let our experts get to work making your attic as efficient as possible.